Prisoners spent five months digging the tunnel and preparing for their escape – and just over four hours getting out through it. 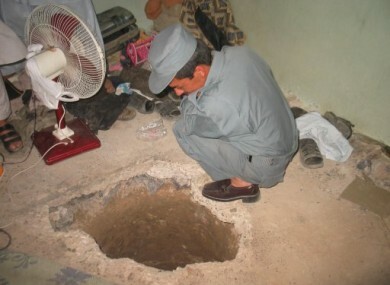 An Afghan policeman inspects the entrance to the prison escape tunnel. AFGHAN POLICE CLAIM to have recaptured a few dozen of the more than 480 prisoners who escaped from the main prison in Kandahar yesterday through a tunnel. The prisoners, many of whom are believed to be Taliban insurgents, travelled through the 320-metre tunnel which bypassed watch towers, prison barriers and government checkpoints. After spending some five months digging the tunnel, it took about four and a half hours to ferry hundreds of inmates right out of the prison on Sunday night, according to a Taliban statement. It is unclear how prison guards did not hear the tunnel being dug or the prisoners travelling out through it. It is also not clear why prisoners were apparently sleeping with their cell doors open, allowing them access to the tunnel entrance in one of the cells. The New York Times reports that Kandahar provincial governor Tooryalai Wesa blamed the escape solely on security forces at the prison. Afghan authorities said today they had recaptured 65 of the escaped prisoners, the AFP reports, adding that they have received “massive civilian support” for their search. This is the second time prisoners have broken out of the prison in three years and some Afghan authorities and former Taliban commanders believe it could strengthen the Taliban’s resistance to a peace process. Email “Search continues for over 480 Afghan prisoners who dug their way out of jail”. Feedback on “Search continues for over 480 Afghan prisoners who dug their way out of jail”.